Hello everyone! 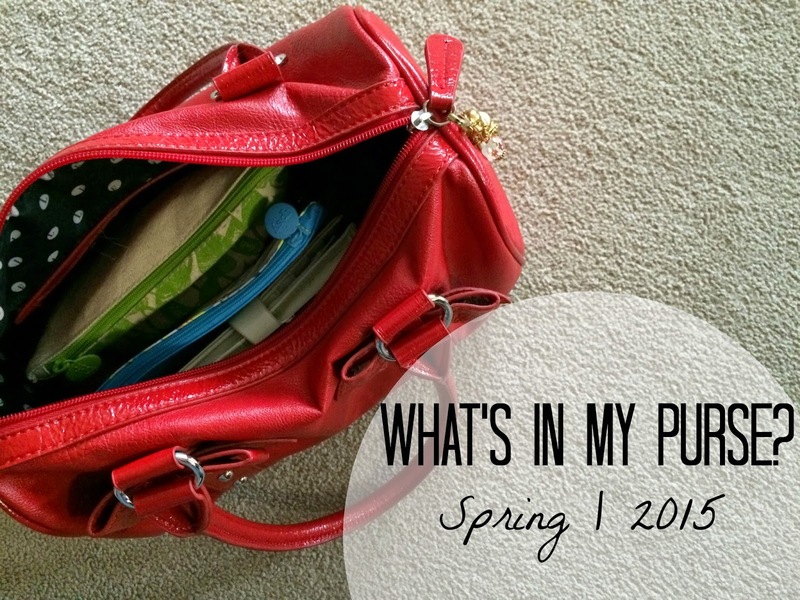 I've been meaning to share what is inside my purse for Spring for awhile now, and I finally got around to it today. *smile* I've done these before on our YouTube channel, but never as a picture post. The handbag that I've been carrying around lately has been this Elle satchel from Kohl's, that I had picked up for a really good deal on clearance several years ago. Anyhow, when ever Spring comes around I like to pull out my big colorful bags to lug my stuff around, instead of the smaller bags I use in the Wintertime. Here is the entire contents of my purse all neatly organized into categories. Yes, I tend to keep my purse fairly organized all the time [if the purse is big enough]. This first Ipsy bag is filled with my medications, tooth past & tooth brush, random hair bobs, and mints. Next Ipsy bag is for my lip products and one perfume rollerball. Too Faced Melted Lipstick in "Fig"
NYX Butter Lipstick in "Hunk"
Rimmel London Lasting Finish Colour Rush Balm in "Sun-Kissed"
2 Rimmel London Lip Liners in "Eastend Snob"
The third and finally Ipsy bag within my purse carries some makeup essentials, in case I need to apply some makeup whilst on the go. Rimmel Scandal'Eyes Liner in "Brown"
Maybelline Fit Me Concealer in "15"
What do y'all keep in your purse? Loved seeing what you carry! I'm pretty much a minimalist when it comes to what I carry with me. I love teeny tiny crossbody bags, and usually just have my cards, keys, phone, and lipstick! Let me see...what's not in my purse?! For reals, I'm horrible about throwing things in without a second thought. Okay I really like this. I'm gonna go home and reorganize my purse when I get off work. Thanks, dear! I use the E.L.F eyebrow gel too! I love that stuff. It works so well. The eyelid primer by E.L.F. works really well, too.